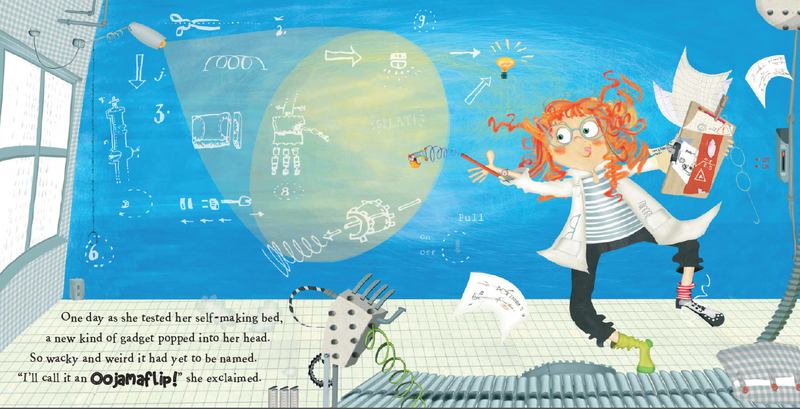 It’s an actual Professor McQuark illustration by Julia Patton! I love it! Probably the most exciting part about getting a picture book accepted is seeing the illustrations. More than any other book, a picture book has to grab the reader’s attention from the very first glance, so the illustrations really are the most important part of the package. I can appreciate much more now why most publishers ask for text only. They may have illustrators they are waiting to work with, they have their own house style to pursue, they have access to agencies with hundreds of artists… in short, they are much better placed to make a decision about an illustrator than you are. The exception is if you are an author-illustrator (a rare but amazing breed!) or an already established partnership such as Hedgehugs‘ Steve Wilson and Lucy Tapper (husband and wife as well as writer and illustrator). Having an illustrator chosen for you also gives you a wonderful chance to see your book elevated to another level, as your illustrator brings a whole new level of interest and fun to your text. This has certainly been the case with the illustrator my publishers, Maverick, have selected for Professor McQuark and the Oojamaflip: the amazingly inventive Julia Patton. Normally Maverick will select perhaps three artists and ask for sample spreads before comparing them and selecting their favourite. The author is consulted as part of the decision but is not in charge of making the final choice. In this case, however, they were keen to work with Julia and knew she would be the perfect choice for a book about wacky inventions. I only had to look at her sample spread to instantly agree! The next time the author will see illustrations is usually when pencil-drawn drafts are produced for each spread, to give a rough idea of how the finished book will look. There is an opportunity for input but again the editor and artist will be making the main decisions. After the pencil stage, it’s time to sit back and try not to fidget too much while the artist puts in the hard graft. As I mentioned in my previous post about promotion, this is a good time to do those pre-publication jobs such as creating a website and Facebook page. When the finished drawings come in and you have picked yourself off the floor in amazement and awe, there is a chance for some typo-hunting, as by now the text will have been laid out on the pages by the editor. At this stage you may get a digital copy, which isn’t actually a virtual book but the real thing. It’s just not the actual book yet. Yes, I don’t understand either. One last check and then it’s off to be printed for real, a process which takes three long months. Time to get very excited indeed! In my next post I’ll be interviewing Julia Patton about inventions, inspiration and interpretation via parrot. Back soon! This entry was posted in illustrations, My Writing and tagged Julia Patton, maverick, Professor McQuark and the Oojamaflip. Bookmark the permalink. Good for you! Look forward to the finished product! And more exciting news in your ongoing adventure is good to hear! We out here who live in that “what if we would get the call world” really enjoy being able to follow along through your words. You get to live the reality of maybe one day….. Pretty darn cool! Looks great, Lou. Exciting times! A nice illustration that fits the story. I am an illustrator and author…not that l feel different from any of you. I am drawn…(not a pun) to the wonderful drawings of Quentin Blake. They are deceptively brilliant…with a few scratchy lines the character comes to life. It looks so easy and yet try and fail. Roald Dahl, sadly no longer with us though his stories live on.